Achari Chicken Tikka is a spicy, tangy and delicious snack. 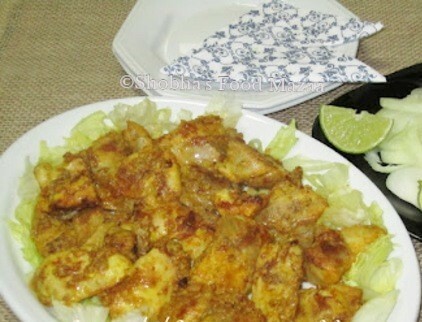 Chicken cubes are marinated with pickle spice mix and grilled to perfection. 1. Clean the chicken and cut into big cubes. 2. Dry roast and grind Saunf, cumin, coriander and mustard seeds. Mix them into the lemon juice along with whole onion seeds, salt, turmeric powder, garam masala and salt. 3. Crush the garlic, ginger and pickle. Mix this also to the marinade along with 1 tbsp mustard oil. Now marinate the chicken cubes in this for a few hours. The more you marinate, the better it tastes as the spices will incorporate into the chicken very well. Keep it in the refrigerator and remove half an hour before grilling. 4. Pre-heat the oven. Line a baking tray with a foil paper and grease it. Place the tikkas and grill them for 15 - 20 minutes, turning them once. Sprinkle the cardamom powder before serving. Serve the tangy chicken tikkas hot , as a snack or ...with naans/rumali rotis. achari murg sounds interesting.. perfectly made.. Very creative way of making tikka.